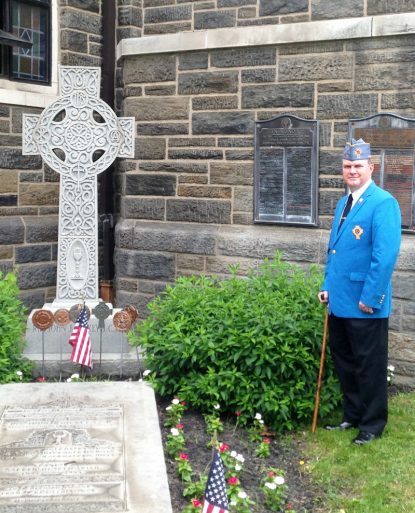 Joseph Pinhak, an active member of Father Hickey Post 731 of the Catholic War Veterans, stands by the grave of the post’s namesake priest and founder, at Sacred Heart Church in Havertown. On Memorial Day, May 28, a small group of men met for Mass at Sacred Heart Church in Havertown to pray for the souls of former comrades who lost their lives in America’s wars. Afterward they continued with a short service at the adjacent gravesite of Sacred Heart’s founding pastor, Father John J. Hickey. At that grave there are also markers from the various American wars of the last hundred years including the First World War, the Second World War, the Korean War, the Vietnam War and the more recent conflicts. It was Father Hickey who at the close of World War II encouraged the men of the parish to found a Catholic War Veterans’ post, and they did so. When it was chartered in May 1946, it was appropriately named Father John J. Hickey Post 731 and the pastor was the first chaplain until he was succeed by Msgr. Thomas G. Falls. Ever since it has enjoyed the support of the parish pastors, including at this time Father Henry McKee, the current pastor of Sacred Heart. Because World War II was especially deadly and a war virtually everyone was convinced had to be fought, veterans’ groups including the Catholic War Veterans were very popular at the time. It wasn’t long before Post 731 had 200 members and according to its history peaked at about 300 — mostly men but some women too — and owned its own Post home. Over time, especially with the passing of most World War II vets, most veterans’ clubs including the Catholic War Veterans experienced a dramatic loss in membership. At this time Father Hickey Post 731 has about 15 active members and meets at a local American Legion Hall, according to Joseph Pinhak, an active member of the group. He was an Army first lieutenant when his unit was shipped to Saudi Arabia on Christmas Eve 1990 and saw combat in Kuwait and Iraq during the First Gulf War. Their casualties were not physically heavy but there were “walking casualties” from the traumatic experience, he said. At this time Post 731’s commander is actually on active duty with the Pennsylvania National Guard in Kuwait, Pinhak said. Other activities Post 731 participates in include a children’s party and a men’s prayer group called Father Kapaun’s Men named for Father Emil Kapaun. He was a Kansan priest who died in a POW camp during the Korean War and has the double distinction of being a Congressional Medal of Honor recipient and having an active cause for canonization in progress. For more information concerning the Catholic War Veterans call 484-800-5582.